The following articles, reports, letters and papers were produced by a wide range of civil society organisations involved in the campaign against the EU – US trade agreement TTIP. They give an overview of existing analysis and debates on Regulatory Cooperation in TTIP. 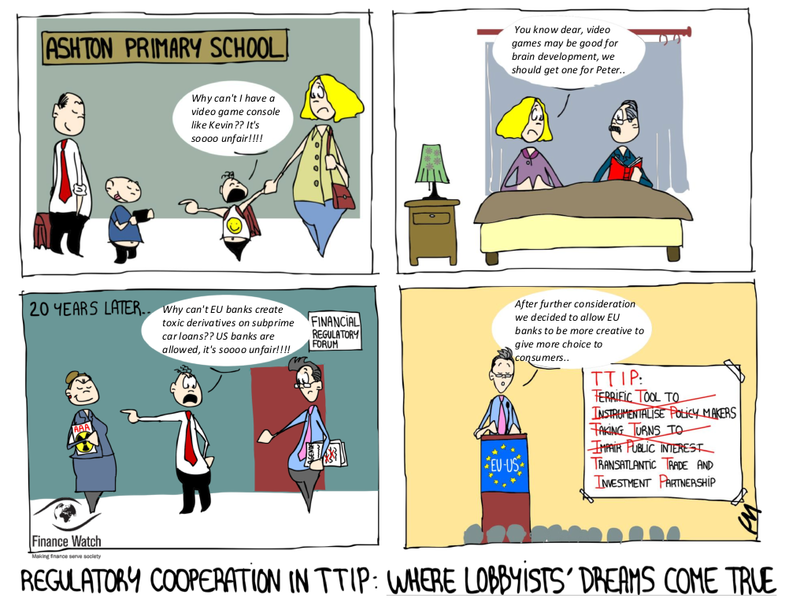 A key summary of civil society’s position on regulatory cooperation in TTIP. Available in French, German, Greek and Spanish. How transatlantic regulatory cooperation under TTIP will allow bureaucrats and big business to attack the public interest. The report examines the origins and impacts of TTIP’s proposals for regulatory cooperation and shows that the process has been dominated by big business right from the start. The examples highlighted in the study are the weakening of EU ambition on the management of hazardous electronic waste, the lack of supervision of the insurance giant AIG in the years leading up to the 2008 financial crash, the free pass offered to US companies on the Safe Harbour agreement that allowed them to ignore rules on the protection of personal data, and delayed or weakened proposals on animal testing, ozone-depleting substances, and aviation emissions. Also available in German. Very useful study of the content of CETA and of the TTIP proposal. The 4 pages executive summary is a recommended reading. Two pages briefing on regulatory cooperation. 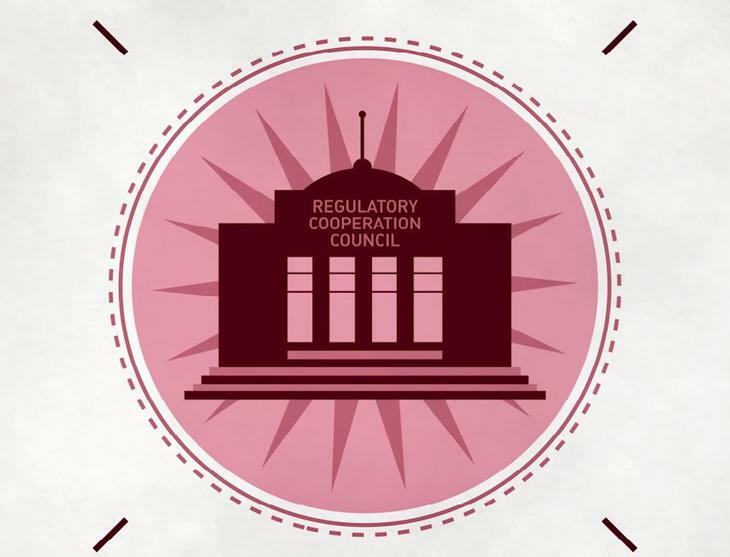 What is regulatory cooperation? What do we know about it? Who are the “stakeholders” who will take part in the process? 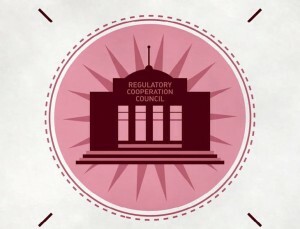 What would the consequences of regulatory cooperation be? Available in French. A blog post by the European consumer organisation Beuc. Excellent framing of regulatory cooperation : “A surreal institutionalisation of lobbying”. While it aims are reducing barriers for businesses, regulatory cooperation creates a labyrinth of red tape “for European decision-makers and (potentially) national governments, and would have the effect of slowing down, weakening or stopping altogether the development of legislation in areas such as consumer protection, health and safety, the environment, labour, public procurement, energy and food”. 3 pages analysis of the content of the January 2015 draft EU proposal. A blog post by the European consumer organisation BEUC. Regulatory cooperation in TTIP is a dangerous process. It will also be very costly for taxpayers on both sides of the Atlantic, and the European Commission is underestimating this cost, says Monique Goyens. Includes a good overview of existing regulatory cooperation mecanisms, including in WTO agreements and in other bilateral free trade agreements. A central aspect of the TTIP threat comes from plans to introduce “regulatory cooperation” between the negotiating partners. Equally dangerous is the “European Commission’s” so-called “Better Regulation” agenda, which is an internal process that pre-dates the EU-US trade talks. “Better Regulation” is promoted as being about cutting unnecessary administrative burdens or red tape at the EU level. In reality it threatens essential environmental safeguards and citizens’ rights. Both processes are creating obstacles and delays for decision-makers who want to introduce new regulations, and they risk creating “regulatory chill” as law makers are discouraged from introducing new measures in the public interest. Detailed analysis of both regulatory cooperation in TTIP (published before the February 2016 new version of the EU regulatory cooperation proposal), and of the EU’s own deregulatory agenda : the “Better regulation” agenda. This short briefing aims at helping campaigners and policy makers understanding “Technical Barriers to Trade” in TTIP. This paper focuses on the Office of Information and Regulatory Affairs (OIRA) within the Office of Management and Budget. There is strong evidence, that OIRA has taken a consistently anti-regulatory posture across both Republican and Democratic administrations. However, OIRA’s true impact, including its slow-walk of regulations is not completely understood due to a basic lack of transparency unique to OIRA. This reports contains ten practical examples of regulations meant to protect people and the environment which were blocked of delayed by the OIRA. History, opacity and case studies about OIRA. A list of recent articles on OIRA by the Center for Progressive Reform.